Predicted droughts and anthropogenic groundwater use will increase the rates of water table lowering in several regions of the world. Spatio-temporal variations in water table depth can have a great impact on physiological fundamental processes, constraining plant performance and, ultimately, survival. In seasonally dry coastal dune forests, groundwater can be particularly important for ecosystem water balance and a relevant water source for vegetation. However, our understanding of the impacts of falling water table on these ecosystems is still poor. Thus, we investigated the ecophysiological responses of coastal dune forests to groundwater changes across contrasting climatic conditions. 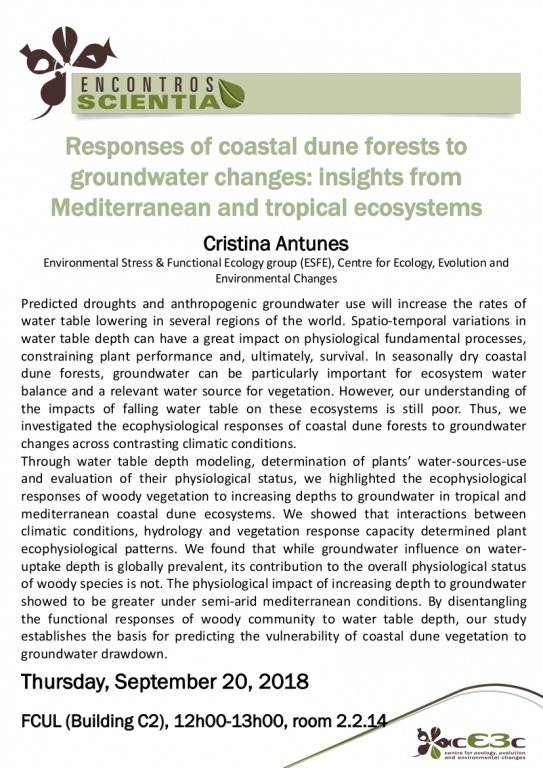 Through water table depth modeling, determination of plants’ water-sources-use and evaluation of their physiological status, we highlighted the ecophysiological responses of woody vegetation to increasing depths to groundwater in tropical and mediterranean coastal dune ecosystems. We showed that interactions between climatic conditions, hydrology and vegetation response capacity determined plant ecophysiological patterns. We found that while groundwater influence on water-uptake depth is globally prevalent, its contribution to the overall physiological status of woody species is not. The physiological impact of increasing depth to groundwater showed to be greater under semi-arid mediterranean conditions. By disentangling the functional responses of woody community to water table depth, our study establishes the basis for predicting the vulnerability of coastal dune vegetation to groundwater drawdown.